To confess deeply, from the heart, is a very humbling experience. Perhaps that is why we do it so seldom. Or maybe it’s only me. There have been times in my life when I have avoided confession altogether, making up excuses why I didn’t need to do it (yet). Besides the fact that I don’t enjoy being humbled (it is too similar to being humiliated), there are other obstacles to the heartfelt confession. Sometimes I long for a confession that will rip open my soul and expose everything – that all of the shame and dread and ugliness of my sinfulness might be healed. It is not just that I am afraid to confess in this way (although, of course, I am). It is more that I often find it nearly impossible to match the timing of my awareness with the opportunity to confess it. One time several years ago, before I had a regular confessor, I experienced such a moment of awareness and knew it would be at least several days before I would be able to go to confession. And it was clear that I would be confessing to someone whom I didn’t know and who didn’t know me. I decided to write it down, to say to God in writing what I wanted to say at the very moment in which the anguish was real and alive. Later, I was glad I had done this. I believe it was during Lent because I had to wait in a long line before it was my turn. Such a relief. No planning or rehearsing. No effort to muster and maintain an appropriate level of compunction throughout the long wait. It was all right there. I had my confession in my pocket. When it was my turn, I briefly introduced myself to the priest. Pulling out my letter to God, I explained that I would like to read it, my confession. The priest seemed a bit surprised but permitted it. Whew. Although I do not recall any of the particulars of what happened next, I know that it was good. It was absolution, a true mercy descending into my heart where once anguish had prevailed. It is hard to predict when those moments of awareness will occur – the moments in which God allows me to see how much I can drift away from Him in a mere 24 hours. Sometimes these moments occur when there is an unanticipated crossroads between hope and despair. It may seem as though everything is fine, perhaps even better than fine. I have positive hopes and the sun is shining in my soul as I pray. A few hours later, I see it. I see all of the time I’ve wasted, how selfish I’ve been, how what I thought was a glorious moment was indulgence in pride. No wonder it felt so good. It was sin. In moments such as these, there is a temptation to hopelessness. How could I have gone so wrong? The wretchedness takes over my thoughts and I realize that I am lost in darkness, emotionally and spiritually. Not only am I lost but, I now know, I am powerless to find my way back to the light. Perhaps there is no way back. Perhaps there is no light to return to. Perhaps my notions of God and love and salvation are one massive delusion. Perhaps there is no hope. Is it even worth crying out into the darkness? Yet the only alternative is utter despair. And so I cry out, from the deepest part of my heart, “I need You!” Tears flow and I rock myself, praying that grace will come. With open arms, He embraces me in forgiveness and healing. A sacramental moment. But the Sacrament of the Church is even more than this, if that be possible. Though humbled and healed, my repentance is far from finished. Jesus held out his hand and rescued me, as He did Simon Peter when he lost faith while walking on water, but the work of forgiveness has just begun. When I am alone and afflicted, He will not abandon me. Yet He has also made it clear that His forgiveness of me is not just a personal gift. It is more like a seed He has planted deep in my heart. I need to water it, nourish it, cultivate it until it has taken root and become part of me. This seed He has planted is His mercy, struggling to mature in me that it might bear the fruit called forgiveness. I have said these words more times than I could possibly count. But do I really understand what they mean? Some have said that it means that God will not forgive me if I do not forgive others. That, however, does not sound quite right to me. It would seem to imply that God’s mercy has restrictions on it – that it will not to be given to those who fail to show mercy. This might sound “just” if we assume a legalistic perspective on salvation. Why should you be forgiven if you won’t forgive others? Although it may sound as though Christ is demanding that I forgive, in actuality, He is explaining to me what forgiveness means and inviting me into the heart of it. In His parable, Jesus is telling me that if I cry out for mercy merely to relieve my personal suffering and do not allow myself to be transformed by it, I will continue to be subject to the eternal death. Let us go back to the seed planted in me when He forgives me. If this seed of His love falls on fertile soil, in my absolution, His mercy takes over my heart and grows there. He does not and never will withhold His mercy. Yet if I fail to cultivate the seed of His mercy in me, it will die. And alone, I will die with it. In the prayer He gave us, Christ our Savior explained to us what true forgiveness means. Being forgiven and being forgiving are inseparable if we are to truly participate in the divine Life. If I receive God’s forgiveness yet do not allow it to be given through me, can I say that I have accepted His mercy into my heart, that I have been transformed by it? Or might I just be carrying out a ritual duty to relieve myself of guilt? Should I desire only the latter, I may just as well put my sins on the head of a goat and release it into the wilderness. I will have symbolically discharged my guilt but I will not have participated in the divine Life. If I forgive others but do not allow God to forgive me, my forgiveness is suspect. At best, it is a noble human effort devoid of true holiness. At worst, it is a sin of pride in which I resist being humbled, imagining that I can do without God what God alone can do through me. On the other hand, when His mercy does take root in my humbled heart, I cannot help but become a forgiving person. Even when I feel unable to forgive, when I am too blinded by my hurt or pain, Christ-living-in-me is at work if I have allowed His mercy to take over my heart. What I don’t know how to forgive, He forgives from within me. Surely He knows my weakness. Surely He knows that, apart from Him, there are some things (perhaps many things) that I am incapable of forgiving. But this is the point of sacramental forgiveness – to transform me from a place of death into Life. It is in this Life that I become like Him, not of my own accord, but because of His great love. It would be far more comfortable to privately tell God of my sins than to acknowledge them before another. But this “comfort” would allow me to believe that my sinfulness (and thus my forgiveness) has nothing to do with anyone but me. It would not humble me nor would it draw me into the transformation that makes my heart merciful. In order for the seed He plants to grow within me, I, like a gardener preparing the soil, must dig deep beneath the surface, past the rocky soil and thorns (Matthew 13: 3-7). Only in this way do I reach the fertile soil of my humility. It is hard work and seldom comfortable. Yet fail to do it and His mercy will not take root within me. The digging means that I must admit before others that I am a sinner, no better than anyone else and quite possibly worse. The truth of this becomes much more real when said aloud and alone, without a congregation to hide behind. Once accepting the reality of my sinfulness, when a brother or sister sins against me, I am unable to condemn them for I cannot help but be in sympathy with their dilemma. For their dilemma is my dilemma. Their sin is my sin. When I see someone sick with the same disease from which I have been delivered, how can I not share the antidote with them? When I see someone under attack by my enemy, how can I not rush to their aid, knowing that someone first rescued me from his grip? I cannot accept mercy, truly accept it, without becoming merciful. I cannot become truly merciful without Christ forgiving from within me, teaching and transforming my heart through every obstacle. May I dig deep – may we all dig deep. This entry was posted in Uncategorized on March 7, 2019 by mary. I must admit that I didn’t want to do it. And I had no good reason for not wanting to except a certain selfishness with my time. I have made an effort to make Sundays my Sabbath. I go to church, I pray, I prepare meals, perhaps read or do some artwork. But it tends to be quiet time for myself in which I try not to let things like work or shopping intrude. But no one was asking me to work or shop. I was invited to a special fellowship meal at my church after Liturgy, commemorating the one year anniversary of the passing of our late pastor, also my dear friend. I was asked to help out in serving and cleaning. While I am naturally rather lazy, it wasn’t that I didn’t want to help out as much as I just wanted to go home and do the things I had planned to do. I hadn’t had much time to myself in recent days and felt the need for that. And I did want to honor and remember our pastor but Liturgy felt like the place for me to do that. Or so I told myself. However, I also knew that my feelings were generated out of selfishness and that once I got there, it would be fine. I love the others at my church and sometimes have to push past my introvert tendencies to remember that I will enjoy and benefit from their company. The decision was complicated, however, by one other factor: a major snowstorm that had struck the area the night before. A foot or more of fresh white snow covered my driveway, with the icy crud left at its end by snow plows. My last regular snow shoveler went off to prison. The one before that disappeared after years of service. Well, I’ll try, I thought. If I can’t get the car out, then I’ll walk to a closer church but I need to try. I don’t want my selfish/lazy/introvert self to dominate my decisions. And thus began a saga, not of my planning. I had backed out no more than 20 feet or so from the garage when the car stopped. I realized then that I was in deeper than I had expected. Oh well, I thought. I’ll drive back into the garage on the tire tracks I just made. I’ll find someone to shovel for me later. I don’t know who or when, but I’ll find someone. But the car wouldn’t move forward either. I didn’t like this. Having grown up in Minnesota, I learned early on some of the basics about unsticking cars that are stuck in snow. So I tried these steps, gently rocking the car backward and forward, by switching from drive to reverse and back again a few times, trying to get traction without burning snow into ice. The only problem was that the car wouldn’t budge. Not even a little. I could see that there was a lot of snow under the car, of course, as well as around the tires. I’ll just shovel a bit around the tires until my “rocking” tactic works. I certainly knew that I couldn’t shovel the whole driveway – or, if I did, I would have to do it in small parts over the course of the day. In the past, I have sometimes found shovelers when someone walking down the street felt sorry for me and offered to help or a person in need came to the door hoping for a job. So I shoveled a little and tried to move the car. Shoveled a bit more, still no movement. Got the smaller, lighter shovel from my trunk, still a no go. Hmm… getting tired, guess I’ll need to let it go for now. My first sign that something was amiss was a bit of sparkling light in my visual field. I sat in the car for a couple of minutes to rest. I’ll go in the house, I thought, my hands are cold and I’m not getting anywhere. Getting out of the car, that odd sparkly sensation in my vision and head came back full force. Taking care, I walked around the car and then rested with my hands on the hood. The door into my house was about 20-30 feet away? Not far. But then something really strange happened. I found myself lying in the snow in front of my car. I didn’t quite know how I got there. My clothes were wet from the snow. Oh well, I can change into something dry. I got up, brushed myself off and headed for the door again. The next thing I knew, I found myself lying on the garage floor in front of my door. Hmm… very strange. Drawing my house keys from my pocket, I finally got inside. Shortly after getting inside, I noticed my glasses were terribly bent out of shape and the right side of my head was beginning to hurt. I must have hit my head but when and on what I did not know. I had no memory of it. I instinctively took off my coat and sweater to cool down and looked for a chair. The sparkly feeling in my head was gone and I was glad of that. After a few minutes, it occurred to me that I hadn’t locked the car. Oh… I don’t have my car keys. Where could they be? Putting my coat back on, I ventured out. There they were, in the snow by the hood of the car where I had fallen the first time. Needless to say, I spent the afternoon in the emergency room being monitored and scanned. And, of course, not doing any of the things that I had wanted to do instead of serving a meal to my friends at church. It is now two weeks since all of this happened and I am fine. But I must confess that it took me much longer to recover than I thought it would. It is interesting how easily we minimize the impact of damage to our bodies. “I should be back to work in a day or two,” I thought. Try a week. I have a real feel now for people who resist going to the hospital with signs of a heart attack or stroke. While I understood it intellectually before, I now get it. We don’t want to believe that anything is seriously wrong and so we assume that we’re okay. Thankfully, nothing truly serious was wrong with me. No hematoma in the brain. No abnormalities in my heart. But there could have been. This is just one of the small lessons learned in this rather fascinating experience of mine. Allow me share a few of God’s messages that came through to me. I had fallen into the trap and I knew it. I had been imagining that my time that Sunday afternoon was mine and I didn’t want to give it up or even share it. I wasn’t thinking about my life belonging to God – or at least not my time, which is basically the same thing. Now, in the past, when praying, I have asked God to knock me in the head if I start wandering away from Him – “never let me be parted from you, O Lord”, I would pray. Of course, I’m not suggesting the God caused me to hit my head just to teach me a lesson. But He allowed me to choose foolishness and then taught me through it. This was just the first of the lessons, the “messages”, if you will, that God has been sending me in the last couple of weeks. In addition to what didn’t occur, there is much cause for gratitude for what did happen. So many people, friends and strangers alike, were so very kind to me. From EMS and ER personnel to Uber drivers and neighbors I’d never met (they shoveled out my driveway the next day without me even noticing). A friend drove me around and was willing to drive me more, acting as though I was doing her a favor by allowing her to help me. My brother texted me to check on me when he was busy with many things to do. And so on. I am grateful. I am so very blessed – and I have done nothing to deserve it. Another wonderful message from God was an increased awareness of what an amazing thing my body is. While all of the medical procedures will likely cost me thousands of dollars, it occurred to me that none of them (except the ice pack given in the ER) had any role in healing me. They were all performed to make sure that there wasn’t something else wrong. My body has been healing itself – and it has been fascinating to watch and learn. You may be wondering, as did I, “Why did you pass out in the first place?” While the final word isn’t in yet, the most likely explanation is vasovagal. I fainted. Standing still after exerting myself caused blood to pool in my lower extremities and away from my brain. I read online that the very best thing to do if you feel like you are going to faint is to lie down. This restores balance to the blood flow so that the brain isn’t short-changed, thus preventing the brief loss of consciousness we call fainting. Since I didn’t know to do that, my body did it for me. In passing out, I was left in a prone position so that my brain could get the oxygen it needed. Getting my head whacked… well, that was just an unfortunate side effect to my ignorance. In addition, for the last two weeks, I have been watching the amazing display of swelling and colors that have moved me from having a “goose egg” sized bump (I now know what they call it that) to a deep purple swollen eye to various shades of yellow, green and blue on various parts of my face. While it all looked rather gruesome, my body knew what it was doing. Sending blood to aid in the healing at the site of impact, clotting enough so as not to bleed too much, gradually spreading the blood back through nearby tissue to enable it to be reabsorbed. Quite an extraordinary process. And the healing process made me feel out of it and more easily tired, a sure-fire way to stop me from disregarding the energy demands required by healing. In the grand scheme of things, this injury was minor but its lessons were powerful. To have my weakness pointed out to me. To be reminded that I am loved and that God is with me at all times. To be made aware of the value of gratitude for so many things that I take for granted. To be taught a greater empathy for the sick and injured who suffer daily, barely noticed by me. To be shown close up how wonderfully God made this body of mine. Perhaps I should not change the words of my prayer after all. God, in His wisdom, knows just when I need a knock in the head so that I do not stray too far from Him. All praise and glory to Him forever. Amen. This entry was posted in Uncategorized on February 3, 2019 by mary. 2019… the word that found me. As December, 2018, was drawing to a close, I thought perhaps this word was choosing me again for the new year. Certainly I had not learned all that I could from its lessons. No other word seemed to be emerging. Until it did. I recognized it because it had knocked on my door before. Before, it was not time. Now it is. An interesting feature of my 2019 word, however, is that it may be understood as either an adjective or a verb. Experience has taught me that, when given a word that is a verb, I must prepare myself for change. And, quite often, it is not a change that I would have chosen. I expect I will experience my word in varying ways throughout the coming year. I may have the unpleasant experience of feeling empty inside, either on a worldly level or a spiritual level. Well… probably both. As much as I do not enjoy this, I know it will be for my good if I recognize God’s hand in it. To experience my emptiness is an opportunity to recognize how very much I need Him. If I remain filled with thoughts, emotions and activities, I can too easily slip into considering God just one part of my otherwise full life. When I am confronted with the utter emptiness of my being, it is either God or despair. I pray for the grace to always turn to God at such moments. As much as this adjective will likely follow me through the year, the verb is right behind it. Have among yourselves the same attitude that is also yours in Christ Jesus, who, though he was in the form of God, did not regard equality with God something to be grasped. 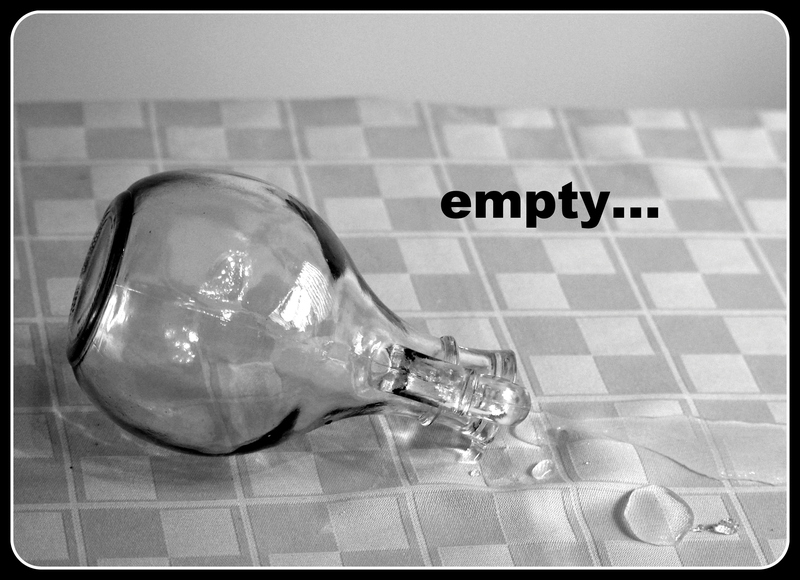 When I heard these words, I knew without a doubt that “empty” was my word. He emptied Himself. In following Him, am I not also to empty myself? His emptying was a lowering of Himself from His glorious power as God to become one of us. My emptying will surely be of a different sort. Yet there runs a parallel as I learn to accept the true lowliness of my being – to accept that I am not in control and that, at any moment, I may be called upon to surrender without reservation anyone or anything that I love. And it would be scary if my emptiness were the final state of affairs. It would be scary if my self-emptying were merely part of a hard and cruel existence devoid of any meaning. But I am embracing my word so that it might lead me, that in following the Savior I might empty myself out of love – or, perhaps better said, I give myself to Him completely that He might empty me. For what He empties, He fills. +All glory and praise to Him forever. Amen. This entry was posted in Uncategorized on January 1, 2019 by mary. Once again, God has blessed me profoundly, more than I could ever dare ask for. Not only has He allowed me to render an image of Christ our Savior and His holy Mother, but He invites me more and more deeply into the truth which it represents. 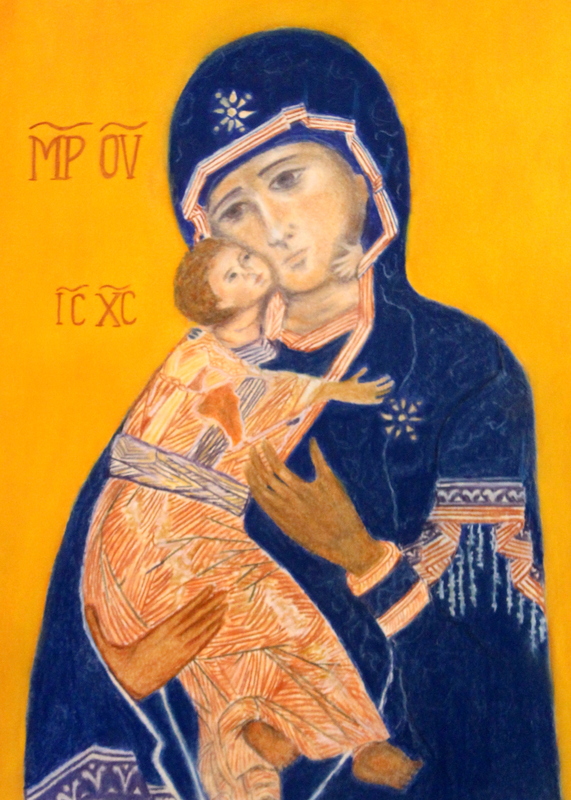 The Theotokos of Vladimir was my first attempt at iconography. I knew that I was unworthy. I knew that I was using nontraditional materials (pastels). But I prepared with reading and prayer and sacrament. Such a holy task cannot be undertaken without the help of God – and the holy Virgin herself. The process was prayerful, gazing on the image, entering the image and allowing Mother and Child to enter me. Today, as Christ is born anew in my heart, I share with you what I was given. All praise to Him, Father, Son and Spirit, now and always. Blessed be His holy Mother, our Mother now, and all the angels and saints. Alleluia! This entry was posted in Uncategorized on December 25, 2018 by mary. By the grace of God, I find myself writing in a different way. This way draws from something deep inside of me, cracking open a part of me that I didn’t know was there. Or perhaps I knew it was there but was afraid. Yes, I think that is it… I was afraid. Who am I to draw the Mother of God? Who am I to fashion an image of Christ Himself? I am no one in particular, just one among many. My soul is stained with sin. My talents are modest at best. I am grateful that I was forewarned. To write of God in image is quite different than pursuing art as a craft. Or at least it is for me. Perhaps true artists see God in every image they bring into being. If so, they have greater souls than me. I must be emptied out. I must fast and pray and give everything over to God. To create a sacred image is to enter the sacred. I can only gaze upon holiness if I have allowed the Holy One to dwell in me – for I am not holy but He can be holy in me. I know that I am not worthy. Please pray for me. Today, in the Western Church, we celebrate the Solemnity of Christ the King. As the feast approached, it occurred to me that “Christ Pantocrator” was the icon expressing His Kingship most fully. My King. The Almighty. The All-Powerful. The Sustainer of all that is. And yet fully human. Loving all of creation. Loving unto death and bringing back to life. My King. And so I have sought – and continue to seek – and must proclaim what I see. All glory and praise to Him Who sustains the heavens and the earth and brings my dead soul back to life. This entry was posted in Uncategorized on November 25, 2018 by mary. This entry was posted in Uncategorized on November 23, 2018 by mary.